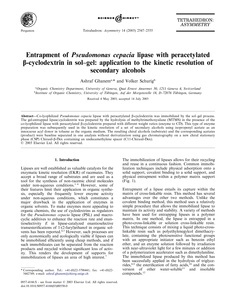 Co-lyophilized Pseudomonas cepacia lipase with peracetylated β-cyclodextrin was immobilized by the sol杇el process. The gel-entrapped lipase/cyclodextrin was prepared by the hydrolysis of methyltrimethoxysilane (MTMS) in the presence of the co-lyophilized lipase with peracetylated β-cyclodextrin prepared with different weight ratios (enzyme to CD). This type of enzyme preparation was subsequently used in the kinetic resolution of a set of secondary alcohols using isopropenyl acetate as an innocuous acyl donor in toluene as the organic medium. The resulting chiral alcohols (substrate) and the corresponding acetates (product) were baseline separated in one analysis without derivatization using gas chromatography on a new chiral stationary phase (CSP) Chirasil-β-Dex containing an undecamethylene spacer (C11-Chirasil-Dex).